Congratulations to Ronna F. from Maryland who won last week’s cookbook, Martha Stewart’s Hors d’ Oeuvres from 1984! This week’s give-away is The Joy of Pasta by Joe Famularo and Louise Imperiale from 1983. 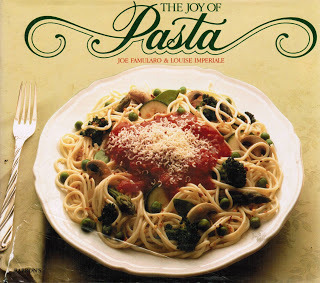 This is a great cookbook that has recipes for fresh and dried pasta made every way imaginable, and contains one of my all-time favorite pasta salad recipes that I have been making for twenty years! If you would like to be entered in this week’s random drawing, send me an email at my address on the right by midnight on Friday, and leave me your name and email address. If your name is drawn, I will email you and get your mailing address to send the book. Good luck, everyone! 2 Responses to Cookbook Give-Away for the week of 5-24-10! Congratulations to Ronna and thank you: another great give-away!!! Thanks, Barbara! And keep on entering every week – there will always be a new cookbook to give away every Monday! I LOVE giving away cookbooks!